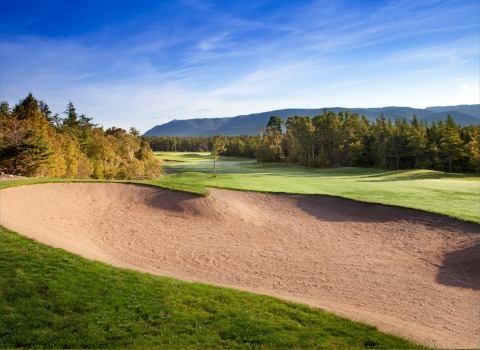 Standing behind Le Portage Golf Club’s 8th green, bag on my shoulder, I linger – just for a moment. It’s late on a clear fall afternoon in Cape Breton. On one side of me is the Gulf of St. Lawrence; on the other the majestic Cheticamp Mountain range, literally at the entrance of world famous Cape Breton Highlands National Park. Lisa “Longball” Vlooswyk is a seven-time Canadian Long Drive Champion, has been a golf journalist for almost 15 years. She regularly travels across North America as a golf entertainer, golf school host, and keynote speaker. Golfers often have bucket lists of the courses they simply must play. 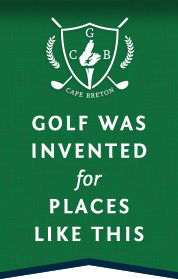 In Canada, I guarantee that Highlands Links, Cabot Links, and Cabot Cliffs are solidly at the top of any player’s list. 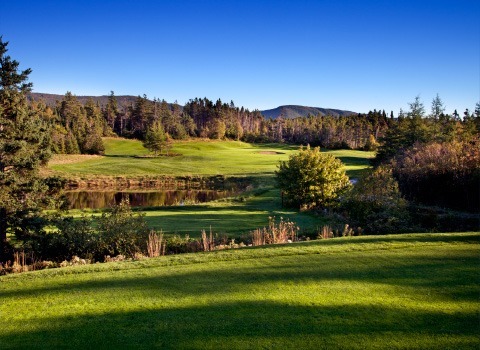 When I planned my pilgrimage to the stunning island of Cape Breton to play these beauties, I kept hearing about a hidden gem: Le Portage.Le Portage is located 45 minutes from Cabot Links and Cabot Cliffs en route to Highlands Links, which is about an hour east. 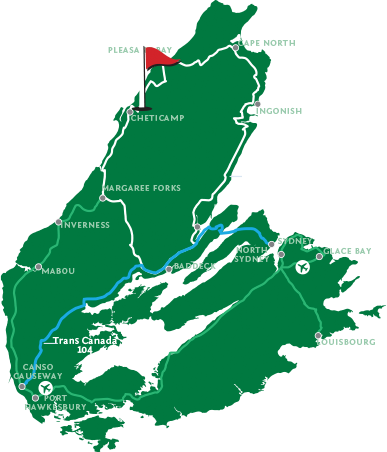 The drive is breathtaking, starting down the Ceilidh Trail and eventually hooking up with the world-famous Cabot Trail. Jagged cliffs plunging into the glistening Gulf of St. Lawrence punctuate the drive. As I arrived in the quaint fishing village of Chéticamp, peppered with Acadian flags and brightly coloured buildings along the water, I knew I was somewhere special. When I pulled into the parking lot and took my bag out of the car I was overwhelmed by the friendliness of all the golfers that were coming and going. I checked in at the pro shop and the staff treated me like I’d been a member for years. I was delighted with the extremely reasonable green fee that reminded me great golf can be affordable. I went out to the deck that has a 360-degree panoramic view of the ocean, the Cape Breton Highland Mountains, and the golf course. I devoured the most scrumptious lobster sandwich outside as I watched people blasting drives down the first fairway. After lunch it was a pleasure to warm up on a nice practice facility, especially knowing I’d have a gallery watching from the clubhouse as I teed off the opening hole. It didn’t take long to recognize that Le Portage is a great walk—I was keen on taking in the scenery though carts were available—and has enough bite at 6,777 yards to be a challenge. Each of the holes has a plaque boasting a French-Acadian name with tidbits of culture and history that bring the course to life. As I worked my way through the course the natural beauty struck me. The lush dense trees, expansive views of the St. Lawrence, shimmering ponds and shapely greens truly feel like a forested oasis. The eighth hole, which features a downhill tee shot with ponds on either side of the fairway protecting the landing area, is the signature hole and a fantastic golf hole. The approach shot is slightly uphill and guarded by fairway and greenside bunkers from 150 yards in. It is a standout indeed. The last three holes are dynamic and intriguing, concluding with a massive elevated green significantly above the fairway. Making two putts to conclude your round is a challenge. Le Portage is that delightful surprise that offers great value, warm hospitality, and a track that will make you want to bring your friends back to play. It may not have started on your bucket list, but you’ll likely tell your friends to add it to the one they keep.